With Streicher Renovation now into its second generation of remodeling, the team has a combined field experience of over 75 years! The three of us have been through countless challenging projects together, and there is little we haven't seen. Because every job is different, having an experienced and creative remodeler means that your job is done right! We realize everyones schedule is different, and so is their preferred form of communication. Whether it is phone, text, or email we have you covered! When you have questions before, during, or after a job, we are here to answer them. Good communication is the key to the success of any job. Providing remodeling services in Dane County for over 40 years has given us a lot more than just on the job experience. Throughout our history we have benefited from building relationships within the community and supporting local businesses. These partnerships help our jobs run smoothly and have helped us become the company we are today. Please inquire for our list of recommended local businesses and sub-contractors. As a licensed Wisconsin contractor, it is our duty to stay educated, and informed to provide the most cutting edge remodeling solutions to our customers. This is achieved through continuing education, on the job training, remodeling conventions, and computer related research and technology. Starting in 2015 Streicher Renovation is offering project design and consulting services using Chief Architect Home Designer. We know from doing our own projects just how dusty, disruptive, and long home remodeling projects can be. This can cause significant stress without a detailed plan, and organization. 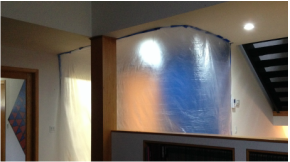 Whether it is keeping the dust out, or organizing a task list, Streicher Renovation makes planning a top priority!